Members of Congregation M’kor Shalom participated in the third annual South Jersey Community Mitzvah Day by formally dedicating the Urban Garden at the Neighborhood Center in Camden. 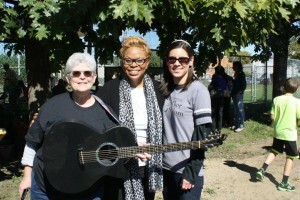 The event opened with inspirational words and music by Rabbi Jennifer Frenkel and Cantor Anita Hochman from M’kor Shalom, followed by remarks from Camden Mayor Dana L. Redd and Councilwoman Dana Burley, Neighborhood Center Executive Director Michael Landis and Garden State Discovery Museum Director Kelly Lyons. Attendees were then invited to participate in fall craft projects, enjoy refreshments, and do a little gardening. The two acre garden is on the grounds of the Neighborhood Center at Kaighn Avenue and 3rd Street in South Camden, and eventually will yield 44 varieties of fresh vegetables, herbs and fruit to be used to help make more than 300 meals a day for the residents of the surrounding neighborhood, as well as the hundreds of children enrolled in the Center’s preschool, daycare and teen programs. The design included raised beds for vegetables, a variety of fruit trees, and an outdoor kitchen for cooking demonstrations and educational programming covering subjects such as nutrition, gardening and the environment. The interfaith effort included volunteers from M’kor Shalom, Rowan University students, members of the United Methodist Church of Glassboro, and the Camden City Garden Club who planted harvested and are maintaining the garden. Donations were used to purchase irrigation equipment, garden tools and kitchen equipment. The kitchen was built with help from Home Depot, which donated 5,000 bricks. The group is still seeking volunteers as well as donations, which will be used to help purchase an improved irrigation system, composter and outdoor grill. If you would like to help make their garden grow, contact Kim Coffina at kcoffina@comcast.net.